I've cracked it! I've finally written up the pattern for those snuggly socks that I've been busy knitting all over the Christmas holidays. It took me a while to figure out how to do it, and then everyone I talked to seemed to want a pair, so I got loads of opportunities to test my pattern. There's something very satisfying about knitting socks. They're practical: everyone needs something to keep their tootsies warm at this time of the year. They're a little bit challenging on the technical front, so, when you finish, you have a certain sense of achievement. And finally, unless you're tasked with clothing a huge pair of trotters, they're fairly quick from start to finish, which is always good for morale. These have been designed to fit my 9 year old son, but you can vary the pattern to fit whatever size foot you'd like to keep cosy. My son's shoe size is European 34, which I think is British size 2, American size 4.5 and Japanese size 21.5 cm. 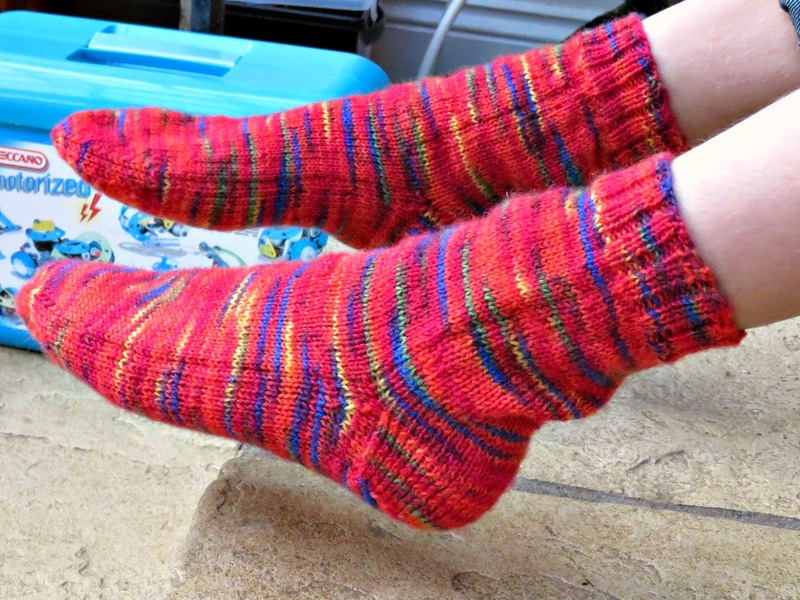 I've knit these with a lovely German wool called Regia, which knits up on size 2 to 3 mm sock needles. I used a set of 4, double ended, 2 mm needles. The wool is a self striping 4 colour yarn (colour number 01937). 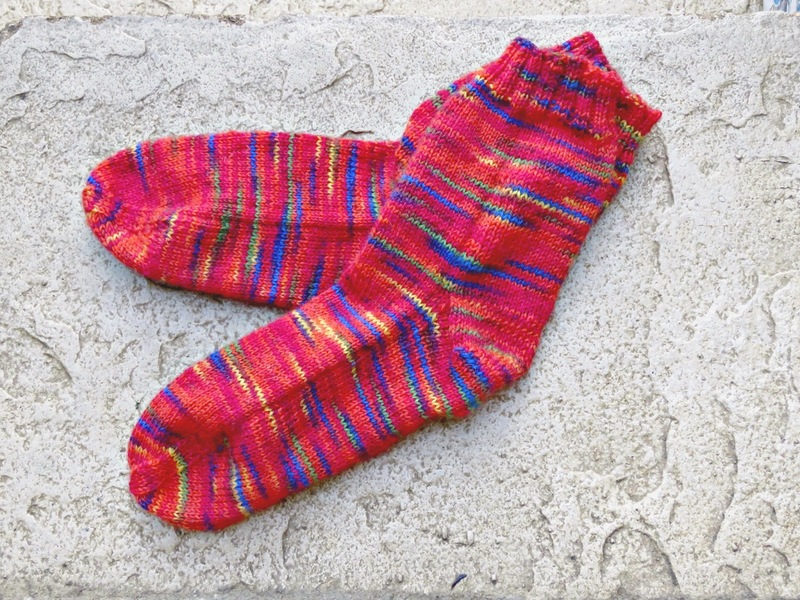 The socks are knit in one piece, in the round, going around and around in the same direction without turning. The heel is the one exception to this. 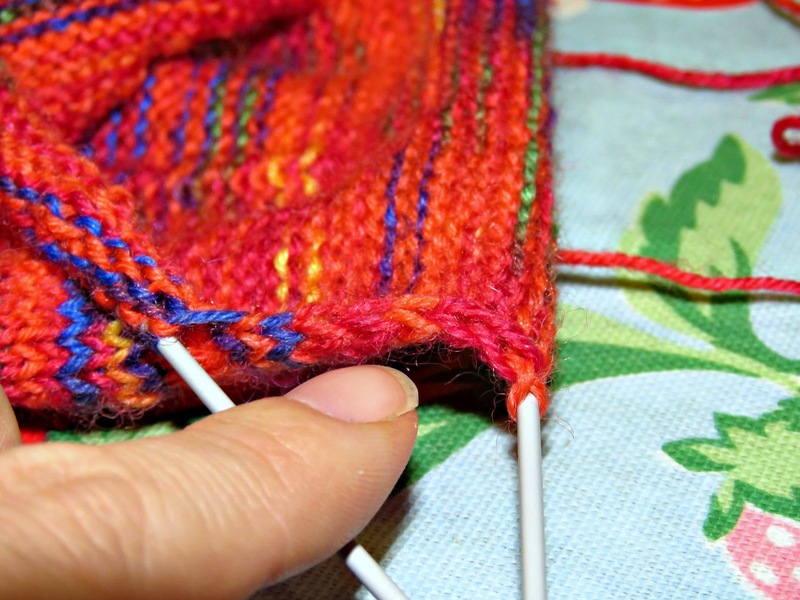 It is knit in plain and purl rows going backwards and forward with the remaining stitches resting on the third needle, and not being worked again until the heel has been turned. 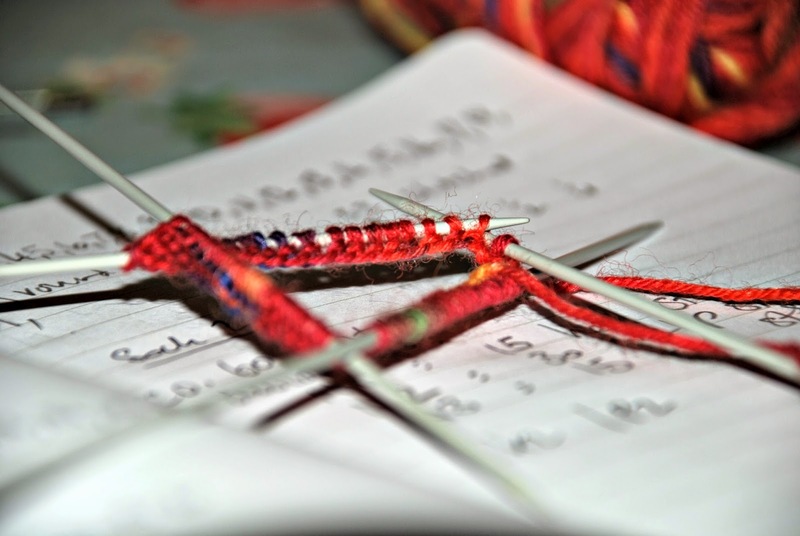 If you'd like to knit some for yourself let me explain in outline what's involved, and then you'll be better placed to vary the pattern to suit your own shoe-size. I've written up the specific pattern that I used later on in the post. 1. The Cuff: this is the ribbed part at the top that helps hold the sock up. 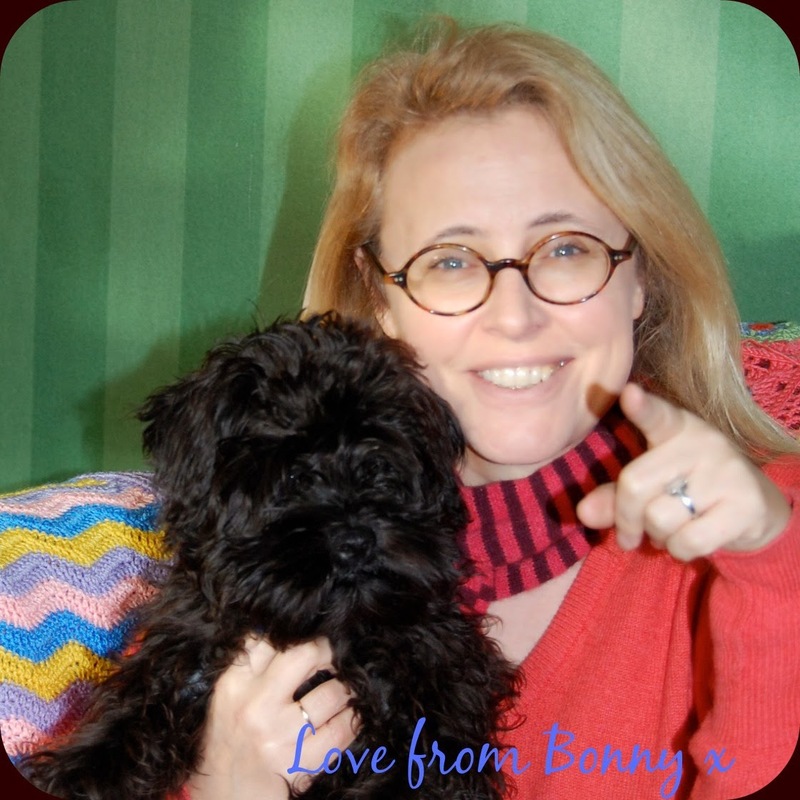 I've knit it in a knit 2, purl 2 stitch all the way round. If you'd like to modify my pattern you should remember that the overall number of stitches for the cuff has to be an even number, and that you should have an even number of stitches on each of the three needles that you use to make it work out evenly all the way round. If you wanted to have a cuff that wasn't quite so tight you could, instead, use a knit 1, purl 1 rib all the way around, which would work out slightly looser or you could knit the cuff on larger sized needles. 2. The Leg: this is the easy-peasy part of the sock that is knit in stocking stitch (plain knit stitch) all the way round. Each row is knit in the round working always in the same direction without turning. You can modify my pattern by knitting this part as long as you'd like the socks to be. You could knit it long enough for ankle socks, knee socks, wellington socks or anything in between that worked for you. I suggest you measure the length of a favourite pair of socks and knit to reproduce their dimensions. 3. 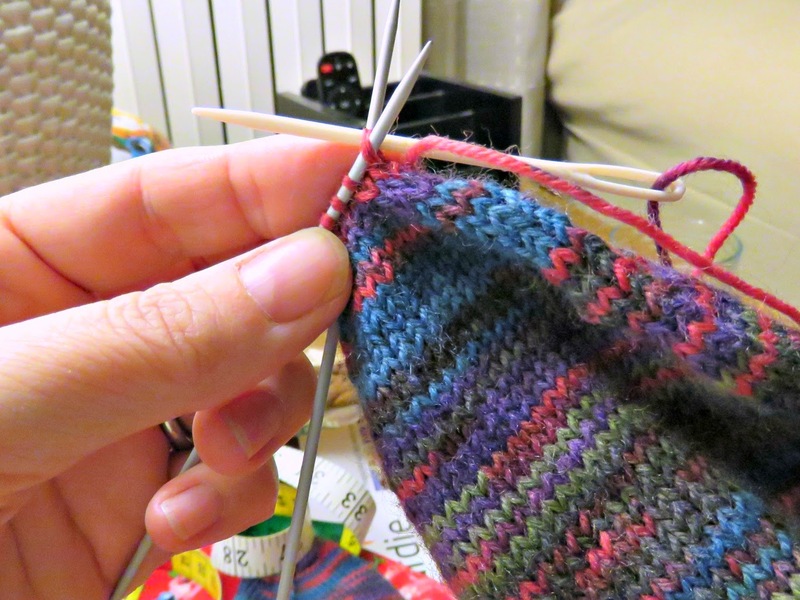 The Heel: this is where sock-knitting gets a little bit more technical. My method involves arranging the stitches on the needles so that half of the stitches are on one needle, and the other half are split between the remaining two needles, which should come in the knitting round on either side of the needle carrying half of the stitches. That is to say you should have one quarter of the stitches on needle 1, which will be one half of the heel, half of the stitches on needle 2, which will form the instep, and the remaining quarter of the stitches on needle 3, which will form the other half of the heel. Only needles 1 and 3 are active in knitting the heel. 4. 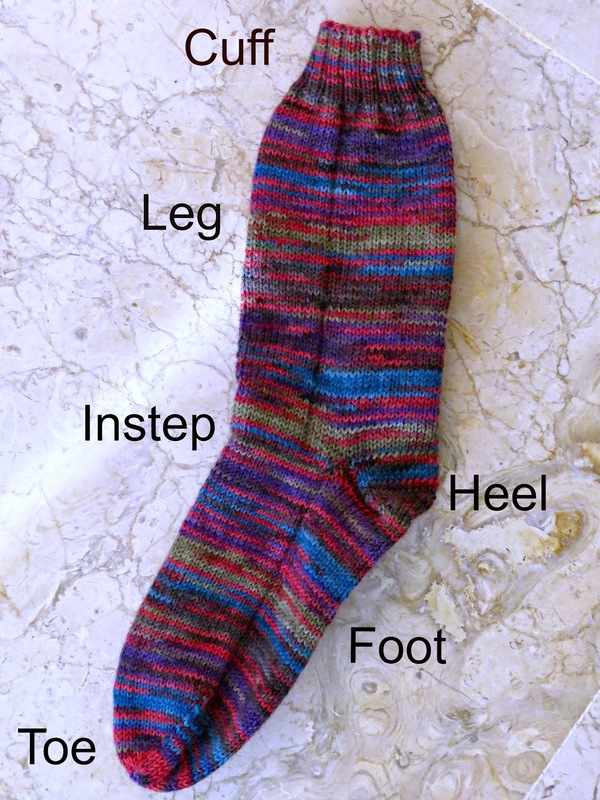 The Instep: the instep is the part of the sock directly opposite to the heel. 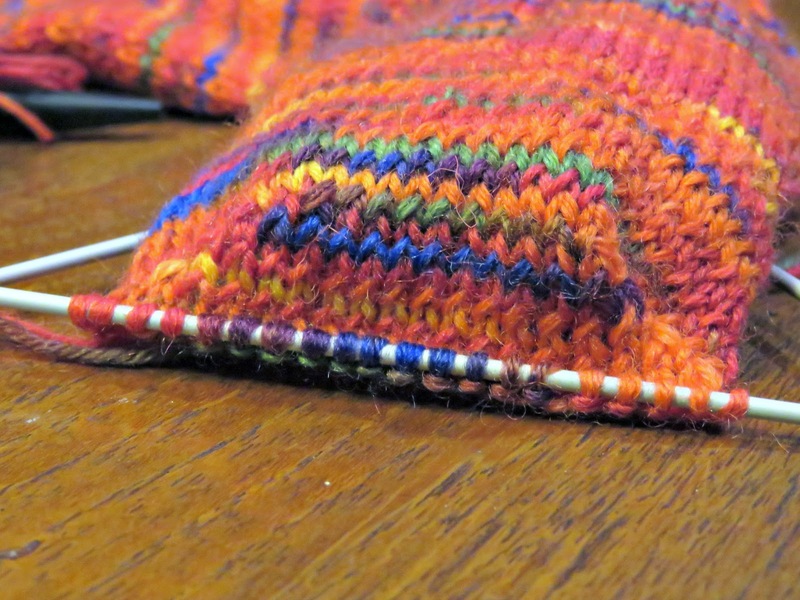 While you knit and turn the heel the instep stitches rest on needle 2. You will carry on with them later once the heel has been turned, knitting them in the round again with the heel stitches. 5. The Foot: this is another easy-peasy part to knit. You just bomb through this in stocking stitch, which is to say plain knit stitch all the way round. As with the leg, you can knit this part as long or as short as required to fit your foot. You may like to measure your favourite socks and knit to reproduce the dimensions of the foot from them. 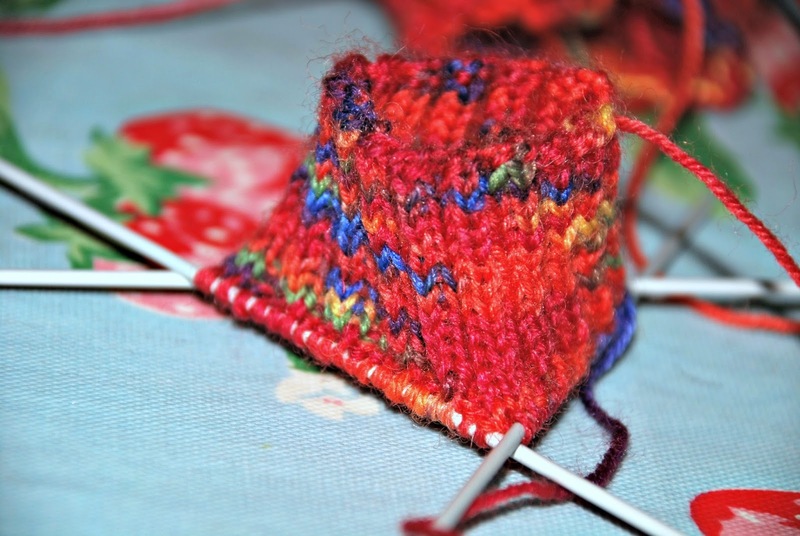 The toe will take approximately 5 cm in length to shape, so you should knit this part of the sock so that it is 5 cm short of the overall length of your foot. 6. The Toe: this presents the second technical challenge, although it's easier than the heel. 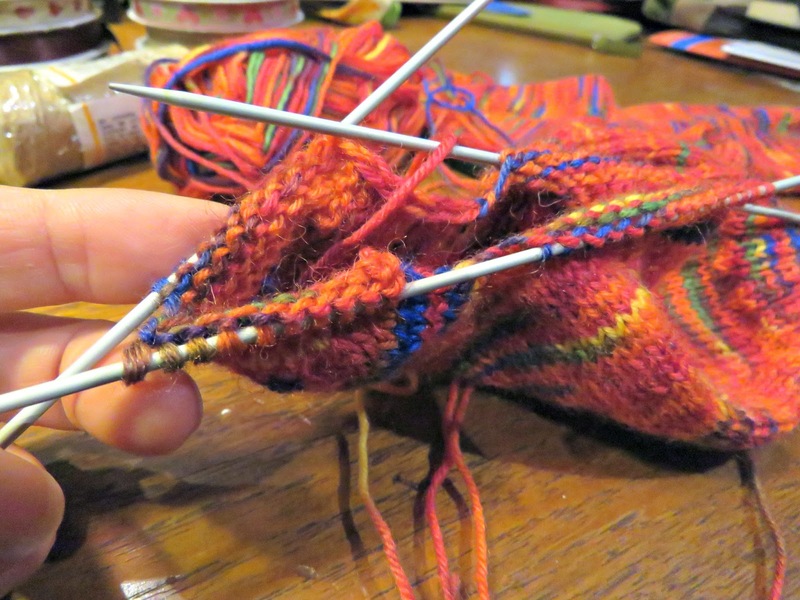 The toe has to be shaped by decreasing stitches, and then finally the remaining stitches are finished off by drawing the wool through them with a darning needle to close off the rounded point of the toe. As I've said above, the toe is shaped over a series of rows measuring 5 cm in length from beginning to cast-off. Well that's the theory, now to put it into practice. 1. Using just one of your four needles cast on 60 stitches. 2. Once you've got 60 stitches you need to divide them evenly between three of the needles i.e. you should have 20 stitches on each needle. Just slip them from either end of the needle you used to cast on, so that you get the 20:20:20 stitch distribution that you need. 3. 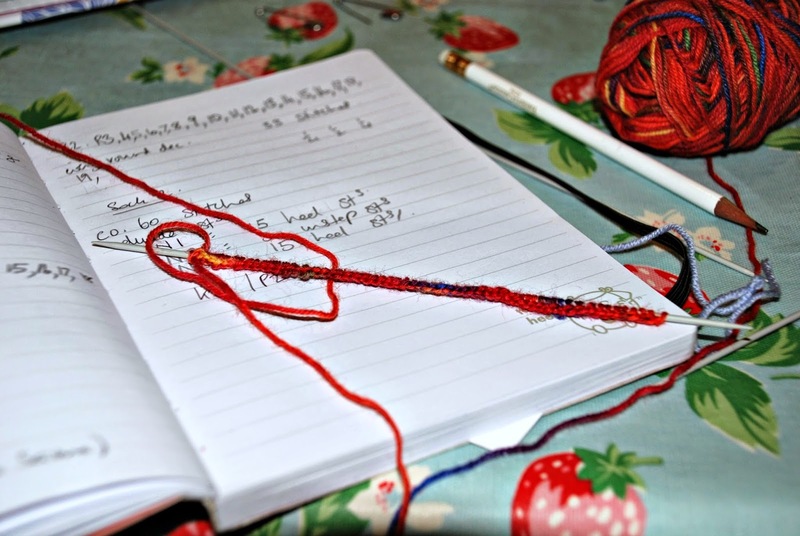 Now close the circle by knitting into the last of the stitches on the first needle with the active end of the wool from the third needle, using the fourth or spare needle to knit onto. Sorry that sounds a bit like techno-speak, but it's not complicated. 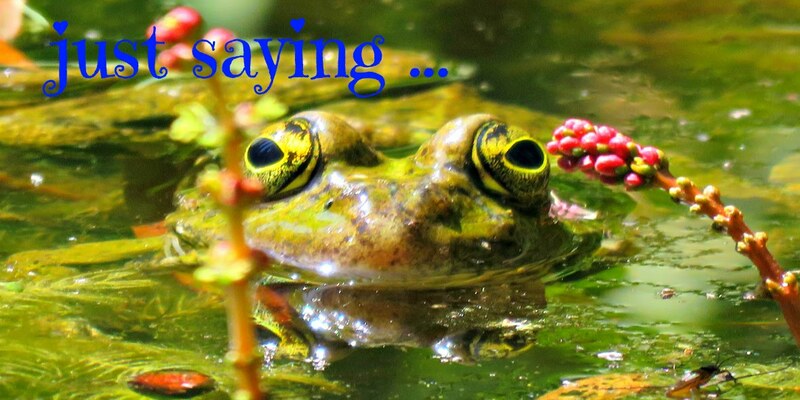 Take a look at the photo below to see what I'm on about. 4. Now get going with that knit 2, purl 2 rib to make the cuff, being careful to keep your tension pretty tight on the first stitch of each round which joins the divide between needles. Keep going, round and round in the same direction, until the cuff measures 5 cm - or whatever length of cuff you'd like to have to hold your sock up. 5. Having knit the cuff you're on to the super easy bit, which is knitting the leg. 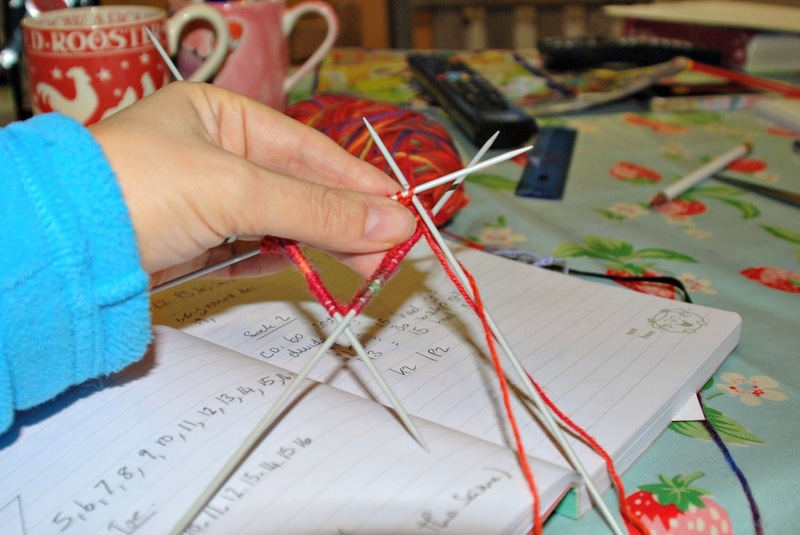 Just keep going with stocking stitch (plain knit stitch) all the way round and round, and never changing direction, until your leg is as long as you'd like it to be. Emi's socks were intended to be short ankle length so I knit a leg of 10 cm in addition to the 5 cm cuff i.e. his sock measured a total length of 15 cm before I got going on the heel. Needle 3, which will be the second half of the heel will have 15 stitches. Needle 3 = second part of the heel. 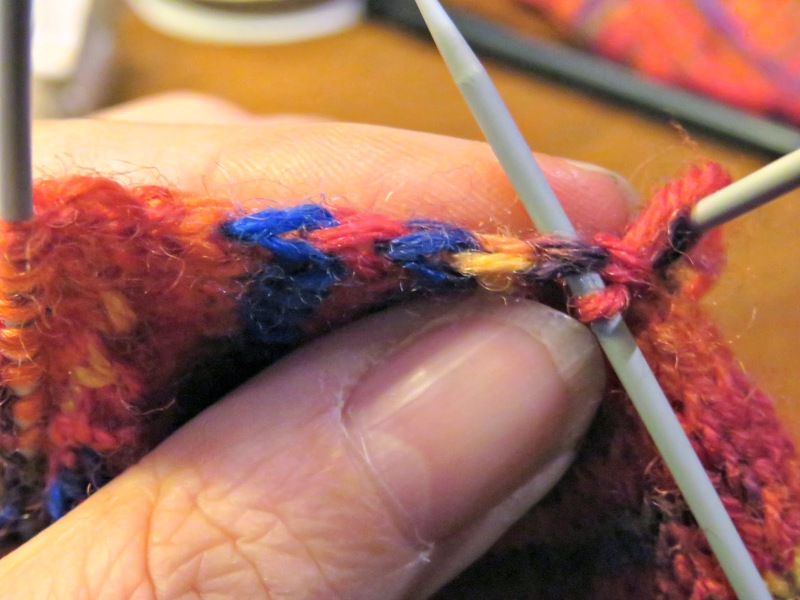 Just slip the stitches at the ends from one needle to the other until you achieve the above count. 7. Now we need to knit the heel. It is knit using only needles 1 and 3. Needle 2 hangs around with nothing to do until after we've turned the heel. Starting on needle 3, turn your work around and purl all the way to the end of the needle (15 stitches), and turn. Row 1 on needle 3: Slip one stitch knit-wise, and knit to the end of the row, and carry on knitting all the way across needle 3 i.e. across needles 1 and 3: slip 1 stitch knit-wise, knit 29 stitches. Row 2. Slip the first stitch on needle 3 purl-wise and purl all the way across needles 3 and 1. Repeat Rows 1 and 2 five times i.e. you will have knitted and purled 10 rows in total to shape the lower part of the heel. 8. Having knit the heel we now need to turn it. The following rows are knit only on needles 1 and 3. Row 1: slip 1 knit-wise, knit 17 stitches, SKPO [slip one knit-wise, knit one, pass the slipped stitch over the knit stitch] knit 1, Turn. i.e. you will have 20 stitches on needle 1 and 9 stitches on needle 3 at the end of this row. Row 3: slip 1 knit-wise, knit 8, SKPO, knit 1. Turn. Row 4: slip 1 purl-wise, purl 9, purl 2 together, purl 1. Turn. Row 5: slip 1 knit-wise, knit 10, SKPO, knit 1. Turn. Row 6: slip 1 purl-wise, purl 11, purl 2 together, purl 1. Turn. Row 7: slip one knit-wise, knit 12, SKPO, knit 1. Turn. Row 8: slip one purl-wise, purl 13, purl 2 together, purl 1. Turn. Row 9: slip 1 knit-wise, knit 14, SKPO, knit 1. Turn. Row 10: slip 1 purl-wise, purl 15, purl 2 together, purl 1. Turn. Row 11: slip 1 knit-wise, knit 16, SKPO. Turn. Row 12: slip 1 purl wise, purl 17. Turn. Row 13: slip 1 knit wise and knit to the end of the row. (18 stitches in total) Then carry on along the space between the end of the row and the instep, lifting 8 stitches along the connecting slip stitch ridge - the ridge that I'm pointing to in the photo below. Simply knit a stitch into the slip stitches at the end of these rows, carrying on all the way across to the instep stitches on needle 2. It produces a slightly awkward looking row of stitches, but we'll fiddle around and redistribute them between needles 1 and 3 when we're done with this row so that they feel a bit more comfortable. Knit all the way across the instep needle (needle 2). Using the free needle, pick up a further 8 stitches across the slip stitch ridge on the other side of the instep needle. 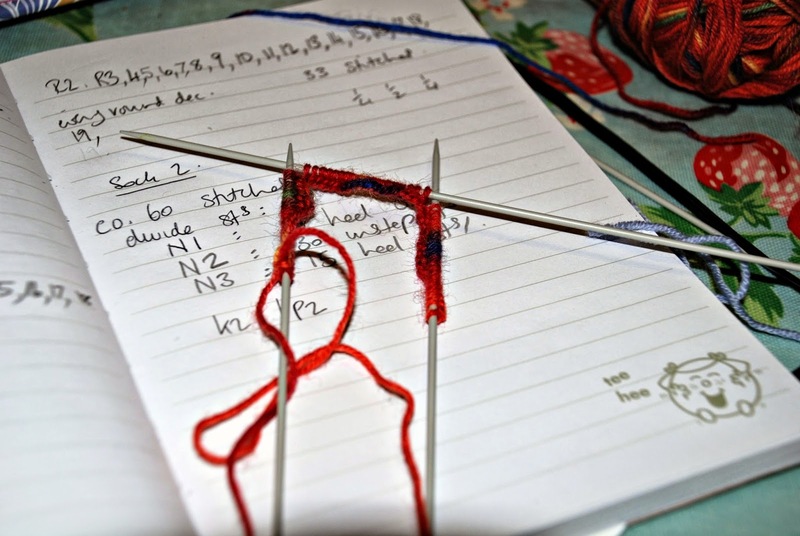 You should now have a total of 64 stitches on all three needles. You should leave the original 30 stitches in place on needle 2 (the instep) and divide the remaining stitches evenly between needles 1 and 3 - do this by simply slipping them off one needle and onto the other (i.e. you should have 17 stitches on each of these two needles). 9. Now we need to reduce the number of stitches back to 60, shaping the gusset of the foot. Needle 1: knit to last 3 stitches, Knit 2 together, knit 1. Needle 2: knit all the way across. Needle 3: knit 1, SKPO, knit all remaining stitches. At the end of row 1 you should have a total of 62 stitches on your needles. Row 2: knit all the stitches across all three needles. At the end of Row 3 you should have 60 stitches once again. 10. Carry on knitting in stocking stitch i.e. plain knit all the way round without turning until the foot of your sock is about 5 cm short of the desired overall length. Needle 1: knit across to the last 3 stitches, knit 2 together, knit 1. ... and then insert the first needle into the front of the stitches slipped to the second needle and knit the two of them together (SSK) (see photos above and below), knit across to the last 3 stitches, knit 2 together, knit 1. Needle 3: Knit 1, SSK, knit to the end. Repeat rows 1 and 2 until you have only 32 stitches remaining in total across all three needles: i.e. you should have 8 stitches on needle 1, 16 stitches on needle 2 and 8 stitches on needle 3. Carry on knitting only row 1, decreasing by 4 stitches each and every row, until only 12 stitches remain: i.e. 3 stitches on needle 1, 6 stitches on needle 2 and 3 stitches on needle 3. Cast off by cutting the wool, threading it through a darning needle and drawing through all 12 stitches. Pull gently until you close over the point of the sock. Knot to secure, and darn in the loose end and the end from where you cast on. Ta-dah! You've knit a sock. Now all you have to do is follow the same pattern to knit the second one.